“Entartete Musik” – Degenerate music: the term used by the leading cultural representatives of the Nazi Regime in order to put the most important composers of the early 20th century from 1933 onwards on the index of forbidden art. These composers disappeared through deportation or exiled anonymously and could not recapture their essential role in the modern world of music to the present day. “Nobody”: term used by the Stalinist dictatorship in the postwar-period to emphasize the lacking identity of Eastern Europe composers, who have survived the cultural genocide of the Nazi Regime. Since 2014, the Festival of Forbidden Music is in charge of the rehabilitation of musical masterpieces, which were prohibited during the Nazi and Stalinist regime. The research of new and disappeared repertoires reinforced the cultural significance of this project along with the pedagogic and social mission. 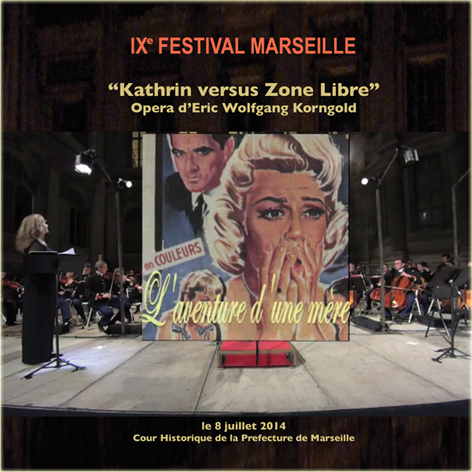 Staged at the Festival of Forbidden Music in Marseille 2014: a dramatized musical adaptation by artistic director Michel Pastore from Eric Wolfgang Korngold's Opera "Die Kathrin". A small town, situated at the boarder of a francophone and a germanophone country during the 30ies: The two protagonists - the German Kathrin and the French singer François - are falling in love at the showing of a film for militaries. François has to leave with his regiment. Kathrin, pregnant with his child, decides - after a moving prayer to the Holy Virgin - to follow him without any documents across the frontiers. During her journey she meets Malignac, who –seduced by her beauty – takes her with him to Marseille, where he owns a nightclub. It is exactly at this shady setting, where the meanwhile deserted François has found work as a singer – next to a hostess called Chou-Chou. The lovers’ reunion is leading to a terrible misunderstanding; whereby, Malignac - later assassinated by one of his companions - accuses François of murder in the hour of his death. Decades later… François is finally finding his faithful Kathrin and their grown-up child in the peaceful shelter of a “stateless” alpine pasture. Korngold’s opera has an actual duration of 2h50, while this production has been shortened to 1h45 by concentrating on the main topics of this masterpiece. Four major parts are covered: Frontier- War- Exile- Free Zone. The spatial arrangement and lighting at the historical court of Marseille’s Prefecture, where exiled persons hoped for a pass of save conduct for their condemned existences, lead to a particular atmosphere between past and present times. Lighting effects along with videos, hidden messages, the on-stage change of soloists, their significant costumes, the singers’ performances, did not only contribute to a simple representation of Korngold’s opera to the public, but it did also show an actualization of the conditions of exile beyond all borders. Wonder child Eric Wolfgang composed from 7 years old under Zemlinksky’s guidance. At 12, he composed a pantomime entitled Der Schneemann (The Snowman) staged at the Vienna State Opera in 1909. Due to their maturity, his early works fascinated Richard Strauss. Korngold composed his first opera Violanta in 1916 in Munich that enchantet Puccini. His second opera, Die Tote Stadt (The Dead City), contributed especially to his international breakthrough. Several operas followed, along with orchestral pieces, lyrics and chamber music. In 1932, he began to work on Die Kathrin which he completed in 1937. During his first stay in Hollywood in 1934, he wrote the film music for A Midsummer Night’s Dream. Numerous film scores were to follow, amongst them also Antony Adverse for which he received an Academy Award. In 1938, Warner Bros asked him to return urgently to Hollywood for the film The Adventures of Robin Hood. Not only did this film contribute to his second Academy Award but also did it save his life. Due to a Nazi order, the première of Die Kathrin was prohibited in 1938 and marked the end of Korngold’s career in Europe. His property was confiscated, but his manuscripts were saved by his editor Weinberger. Korngold did not return to Austria until 1949, when he was mostly ignored by recent modernists. While working on his sixth opera, he died on November 29th 1957. Austrian Soprano Elisabeth Flechl studied at the University of Music and Performing Arts in Vienna, where she achieves a Master in Vocals and Piano. She starts her career at the Volksoper in Vienna in April 2011 as Rosalinde in Strauss’ The Bat. Ever since, she imposes herself as one of the leading Sopranos at the Volksoper in Vienna. Since 2007, she is a permanent member for leading roles at the troupe of the Vienna Volksoper. Vincent Schirrmacher achieves his education in Great Britain, where he learns to play the piano at a very young age. In 1996, he enters the Royal Academy of Music in London and later the Juilliard School in New York, where he passes the competitive examinations with honors. Since 2008, Vincent Schirrmacher is member of the Theatre of the Land Schleswig-Holstein. In 2009, he becomes a member of the troupe of the Volksoper in Vienna. Klemens Sander studies at the University of Applied Arts in Vienna. He gains his first stage experiences participating in Sullivan’s The Pirates of Penzance 2001 at the Vienna Volksoper. He is regularly on stage at “Theater an der Wien”. Born in Romania, Liliana Faraon begins her musical career at the “Lycée des Arts” in Iasi. She continues her musical studies in France and gains the First Price at the Conservatorium of Toulouse. Since her very beginnings playing in Le Comte Ory at the “Opera Comique” in Paris, she is highly successful and finally joins the troupe. She is often invited to sing in France and abroad. Born in Paris in 2000, he begins his musical education at age 6. The two-time first prize winner of National Piano Competition of Lagny-sur-Marne (2008 and 2009) also participates at numerous public concerts. The part Der Knabe (Boy) in Die Kathrin represents his very first stage experience in the opera genre. Born in Marseille, he begins his career as Baritone in classical repertoires in 1984. Since 1997, he occurs regularly as character actor, for instance, in: Carmen, Wozzek, The Land of Smiles,…. BAM 2062 © & ℗ 2016 Bel Air Music - All Rights Reserved.